The Cathar Wars or "Albigensian Crusade"
Cathar Wars or "Albigensian Crusade"
Cathars grew in influence in the Languedoc throughout the twelfth century. Catholic chroniclers record that Cathars had become the majority religion in many places, and that Catholic churches were abandoned and in ruin. Of the Catholic clergy that remained some, perhaps most, were themselves Cathar believers. The Papacy responded initially be intigating preaching campaigns and engaging in public debates, both of which proved humiliating failures for the crack teams of theologians sent by the Pope. The next response, in 1208, was a war, or more accurately a series of wars. Modern writers refer to them as the Cathar Wars, but traditionally the series was refered to as the Albigensian Crusade. It was a formal crusade in the full sense of the word - preached and directed by the papacy, and offering participants the remission of sins and an assured place in heaven. The Crusaders regarded themselves as being "on God's business" and referred to themselves as "pilgrims". From the first major siege (at Béziers) in 1209 the War bacame one of French (+ their allies) against the independent people of the Languedoc (+ their allies). Instead of Catholics against Cathars it was, up until 1242 at least, consistently Catholics on one side against Cathars and Catholics on the other. 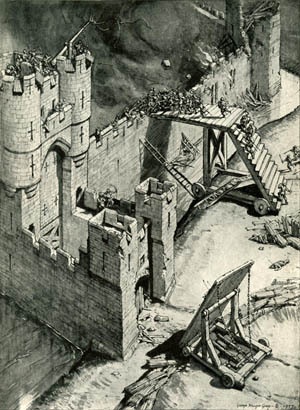 The war saw many sieges, including those of Béziers, Carcassonne, Bram, Lavaur, Lastours, Saissac, Minerve, Termes, Les Casses, Puivert, Toulouse, Muret, Castelnaudary, Foix, Beaucaire, Marmande, Montsegur. These sieges were of castra, ie castles and their associated walled villages, towns or cities. Some gave up without a fight - the desired result of the Crusaders's deliberate terror tactics. These included Fanjeaux and Castelnaudary (after the fall of Béziers and Carcassonne), Lastours and Foix (both for diplomatic reasons after withstanding repeated sieges), Le Bezu and Coustaussa (after the fall of Termes), Peyrepertuse, Queribus, Puilaurens and Aguilar. Terror tactics included mass indiscriminate slaughter as at Béziers and Marmande (and planned for Toulouse), various attrocities as at Bram and Lavaur, and mass burnings as at Minerve, Lavaur, Les casses and Montsegur. The Albigensian Crusade was a Crusade against the people of the Languedoc which began in 1208. It is also known as the Cathar Crusade. Like all crusades it was a war, declared by the Pope, (Innocent III) backed by the Roman Church with promises of remission of sins and a guaranteed place in heaven. Why is it called the Albigensian Crusade rather than the Cathar Crusade? In order to answer this, it is important to remember that Cathar is only of many names the Roman Church invented for members of this particular brand of Gnostic Dualism. Among many other names, they were called Albigensians, from the (erroneous) belief that they were concentrated in the town of Albi. 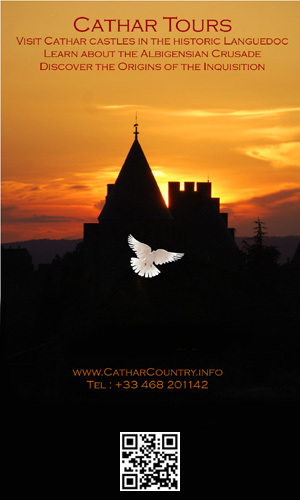 The term Cathar has become the standard term for them only in recent times. 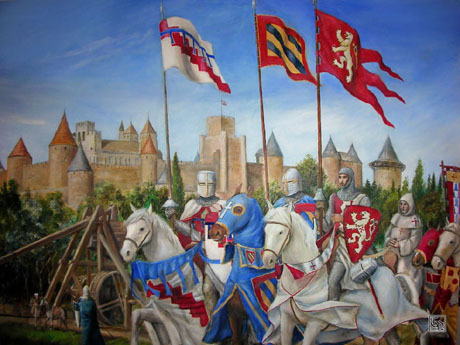 The term Albigensian Crusade (or Cathar Crusade, or Cathar Wars) is used loosely to describe a series of formal Crusades, interspersed with continual warfare against the people of the Languedoc which lasted for some forty years. The (unspecified) target of the Crusade was Raymond V of Toulouse and his vassals, but Raymond joined the Crusade himself. This meant that he and his vassals came under the protection of the Church. That is why the first stages of the Crusade were directed against Béziers and Carcassonne, which did not belong to Raymond of Toulouse, but to a close relative Ramon-Roger Trencavel. The trick did not work for long, and soon Raymond was excommunicated and his castles were under attack. After the initial sieges of Béziers and Carcassonne, the (mainly French) Crusader forces were led by Simon de Montfort and later his son Amaury de Montfort, who were responsible for series of bloody battles, sieges and massacres. Voltaire wrote about this crusade against the people of the Languedoc. We now think of the Languedoc as part of France, but the reality was very different in the thirteenth century. Local chronicles invariably refer to the foreign crusaders as The French, for the very good reason that the chroniclers did not consider themselves or their countrymen as French and neither did anyone else. The Crusades are conventionally held to have ended in 1244 with the fall of the Château of Montségur ( Montsegùr) , though Cathars were still being burned alive into the fourteenth century. An Inquisition was founded to extirpate the last vestiges of Cathar belief. 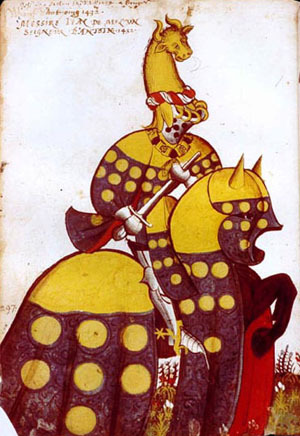 The three knights are identifiable by their arms. Most short accounts of the Cathar Crusades, mention only Simon de Montfort, and many of them confuse him with his son, also called Simon, who played such an important role in English history. The truth is slightly more complex. Arnaud Amaury, Abbot of Cîteaux. This was the military leader of the crusaders during the first stages of the war. It was he who was responsible for the massacre at Béziers and for the immortal words "Kill them all. God will know his own". Some 20,000 men, women and children were killed in this "exercise of christian charity". He also led the siege at Carcassonne. Click here for more on Arnaud Amaury. King of France. The first Cathar crusade was lead by vassals of Philippe Augustus. As the French wars over the continental possessions of the French King subsided his son, Prince Louis, the future Louis VIII King of France joined the Crusade. As king, Louis VIII continued to prosecute wars against the Count of Toulouse and died on his way home from Crusading in the Languedoc. When he died his wife Blanche of Castile, became regent for their infant son Louis IX (later St-Louis), and she also actively pursued the war against her cousin the Count of Toulouse. Ten years later Louis IX reached majrity and took over leadership of the War himself. Crusader Francs besieging Nicea. 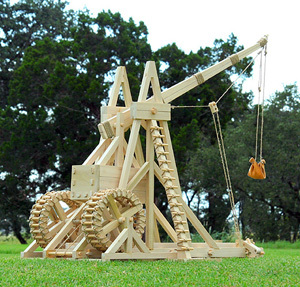 They are catapulting the heads of captured enemies over the city walls to terrorise the citizens. Guillaume de Tyr. 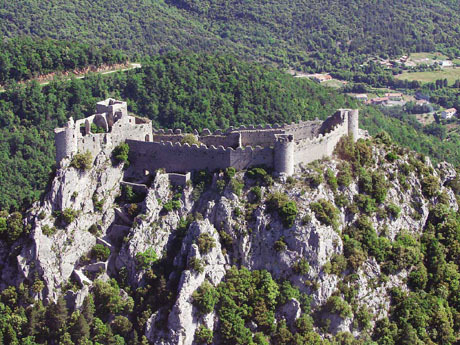 Many of the Crusaders against the Cathar came from traditional crusader families. Defensless Languedoc Cathars are cut down by French Catholic Crusaders. From the fourteenth century Chronique de France (Chronique de St Denis), British Library, Royal 16, g VI f374v. This is the right hand side of a two panel illustration (The left half is shown above). In this panel The leading crusader can be identified by his coat of arms as Simon de Montfort . The Middle Ages saw the development of new modes of warfare encompassing both pitched battles and siege warfare. Then as now the western world was engaged in an arms race. New weapons technology prompted new defensive technologies, for example the introduction of cross-bows led quickly to the adoption of plate armour rather than chain mail. During the Dark Ages Christendom had largely abandoned the sophisticated techniques of Classical times, arguing that anything not mentioned in the bible was of satanic origin and that God would ensure victory for his faithful followers. Along with the scientific advances, military techniques had been abandoned and forgotten. This affected building as well as weaponry. For example the Greeks and Romans had used iron ties to join blocks of stone together. Knowing the effects of rust they encased the iron in lead so that it did not rust, and stonework using this technique survives intact today. Medieval builders did not know about the lead protection and used iron ties that rusted, expanded and fractured the surrounding stone. 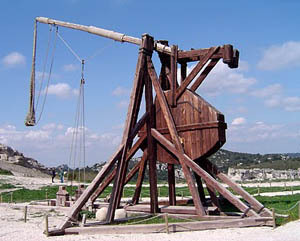 So it was with military engines like the balista and military techniques like the Romans' famous tortoise. So too, ancient techniques for making quick-setting concrete and prefabricated defences were forgotten. 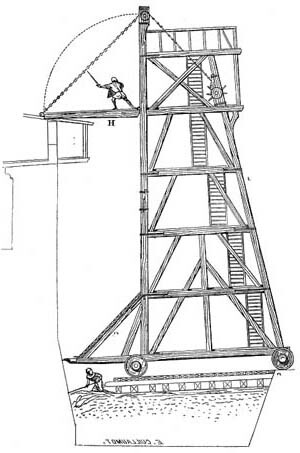 To some extent the development of the Renaissance and the Enlightenment is the story of the rediscovery of ancient techniques. the arms of the defenders (all Occitan). We are much endebted to the work of Brian Timms who first collated much of the heraldic material on which this material is based. Louis VIII, heir of the throne of France, claimed the English throne for a year in 1216/1217. Lord of Courtenay. Lord of Montargis (1180-1184). Given to the king as relief on the sucession of Nevers. Count of Nevers (until 1199) Count of Auxerre and Tonnerre (1184-1219) through his first wife Agnès de Nevers (1184). Marquis of Namur from 1212 thanks to his second wife Yolande de Hainaut (also known as Yolande de Flandre). Emperor of Constantinople (elected in 1216 and crowned in 1217). King Louis VII of France was Peter of Courtenay's uncle. Peter was cousin of Raymond VI of Toulouse. Comte de St-Pol from 1196 (through marrying Elisabeth de St-Pol). Seigneur de Châtillon (sur Marne), Grand-Butler of France and of Champagne (nominated by Thibaut III) and Seneschal of Burgundy (nominated by Eudes III). Hugh de Lacy, Earl of Ulster from 1205. Matthew Paris gives a different blazon: "vert, a bordure or". Hugh fought at Béziers 1209, Carcassonne 1209, Castel 1211, Beaucaire 1216, Toulouse 1218. Simon de Montfort granted him the lordships of Castelnaudary and Laurac. Lord of Montfort, Earl of Leicester through his mother Amicie, countess of Leicester (vassal of the king of England for this earldom). Lord of Bardelle, Bonnelles, Les Bordes, La Celle, Conflans, Epernon, Gambais, Houdan, Méré, Montchauvet, St-Léger, Sonchamp. Brother of Amaury III de Montfort. Half-Brother of Guillaume IV des Barres. A baron's coronet is shown here, because his claim to an earldom was disputed though he was often referred to as a count - the French were sympathetic to his claims to the earldom. Lord of La Ferté-Alais, Béthencourt, Lombers & Castres. Brother of Simon IV. Guy died at the castle of Vareilles near Pamiers in 1229. 1192-1241)Lord of Montfort from 1218 then count of Montfort from 1226. Constable of France from 1231. Son of Simon IV. According to Fox-Davies 'Complete guide to heraldry' the banner shown on the right is borne for the honour of Hinkley. 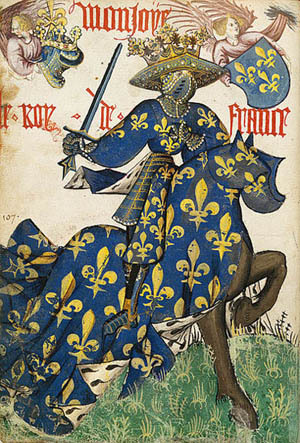 Comte of Bar (sur-Seine) (1189-1219). 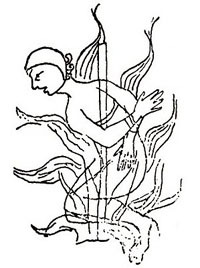 Blazon drawn from a seal dated 1202. The colours are assumed to be those of Brienne (same family). Comte of Eu, King of Jerusalem from 1210 to 1223, Emperor of Constantinople from 1231 to 1237. Son of Erard de Brienne. He fought in the disastrous Fourth Crusade, at Béziers 1209, and in the Fifth crusade. Comte de Saint-Pol (sur Ternoise). Comte de Nevers, Auxerre & Tonnerre through his wife. Son of Gaucher III de Châtillon. The red device is a banner (technically a gonfanon) a reference to that borne by Eustache III, Count of Boulogne, who, with his brother (Godefroy de Bouillon) conquered Jerusalem during the first crusade. This familly is of royal blood through the male lineage. Robert II was a cousin of King Philip II and of Raymond VI of Toulouse. He married Yolande, sister of Enguerrand III de Coucy. Walter became Count of Blois when he married in 1218 the Countess Marguerite de Blois, sister of Thibault VI de Blois. Walter was son of James d'Avesnes. Count of Ponthieu. Son of John I. Count of Bar-le-duc and of Mousson. Seigneur of Briey, Stenay and Longwy. Count of Luxembourg from 1197 through his 3rd marriage with Ermesinde de Luxembourg. Theobald was the brother of Henry I de Bar and father of Henri II (1190  1239), who married Philippe de Dreux in 1219 daughter of Robert II, comte de Dreux and of Yolande de Coucy. Peter, Count of Brittany (1213-1237) and Count of Penthièvre. Earl of Richmond (1219-1250). He was the Son of Robert II de Dreux. He was in England 1216 and fought at Marmande 1219, Avignon 1226, and in the Crusade of 1239 and the Seventh Crusade. Count of Orange. Technically a Prince. The title was conferred by the Emperor (The des Baux had not wanted to recognise the Counts of Toulouse (as Marquises of Provence) as their overlords). Stephen III was count of Auxonne. He is also known as Stephen of Auxonne or Stephen of Chalon. He was descended from the Counts of Burgundy through the male line. His 3rd wife, Agnes, was daughter of Robert II of Dreux. The first two were Beatrix of Chalon and Blandine of Cicon. Philippe II de Courtenay � Marquis de Namur (1216-1226). Also known as Philip II of Namur, Philip was the son of Peter de Courtenay. Count of Champagne and later King of Navarre (from 28 August 1234) through his mother, Blanche of Navarre, sister of Sanche VII. Theobald IV was the son of Theobald III. He fought at Avignon 1226, on the Crusade of1239, and the Seventh Crusade. Count of Guines. Castellan of Bourbourg. Lord of Ardres. Lord of Vierzon , Count of Nevers (1199-1223)., Count of Auxerre and Tonnerre after the death of Peter de Courtenay (but he took possession of Auxerre only after the death of its bishop). His first wife was Mahaut, daughter of Peter de Courtenay. Fought in Gascony in 1212. Pierre des Vaux de Cernay says "The Bishop of Comminges led some of our knights into Gascony and defended it valiantly against the enemies of the faith." Viscount of Turenne, lord of Alvignac and St Céré ( vassal of the Duke of Aquitaine). Viscount of Brassac, lord of Castelnau (vassal of the count of Toulouse). Co-lord of Séverac (vassal of the viscount of Millau - suzerain the king of Aragon). The son of Raymond II de Turenne. Viscount of Bruniquel and Montclar (1224-1249). The illegitimate son of Raymond VI of ToulouseBertrand was half-brother of Raymond VII of toulouse. Bertrand married the Comtoresse de Bruniquel (Countess of Bruniquel) from whom he held the viscounty. According to late XIIIth century rolls, the blazon is argent and gules, but a note of Lacabane suggests argent should be replaced by or. Baudouin was the brother of raymond VI. He was brought up in France and fought on the side of the Crusaders. He bore the same arms as his brother, On one famous occasion causing confusion when he appeared on the horizon with an army which, because of his banner, was mistaken for Languedoc troops. Viscount of Aubusson. Son of Guy. Viscount of Châteaudun. Lord of Mondoubleau , Château-du-Loir, Mayet, La Suze and Louplande. Guichard IV married Sybille of Hainaut sister of the Count of Flanders and Hainaut. Guichard IV was brother-in-law of king Philip Augustus of France and Peter of Courtenay emperor of Constantinople. Constable of France. The tincture of the lion is uncertain. Gaucher married first Adélaïs de Traynel in 1195 then Amicie, daughter of Simon de Montfort, in 1226. Prince of Anduze, Lord of Sauve and Sommières. Co-Lord of Alès. Brother-in-law of Raymond VII de Toulouse. Juhel was half-brother toAmaury de Craon. Juhel died in Egypt. Lord of Marly (le-Roi), Montreuil-Bonnin, Magny (les-hameaux), Saissac and Saint-Martin. He fought at Lavaur 1211 (? ), Toulouse 1211, Castel 1211, Muret 1213, Toulouse 1218 and Avignon 1226  . He was awarded the castle at Saissac, siezed from Bertrand de Saissac. One of his grand-mothers was Alice, daughter of King Henry I of England. Brother in law of Simon IV de Montfort. Humbert V was the son of Guichard IV. Bertrand de Gourdon was involved in the death of Richard Coeur de Lion, in 1199, during the siege of Chalus (near Limoges). He followed the crusaders, took Puylaroque and plundered Lavaur. Lambert became Lord of Limoux (known as Lambert de Limoux) and Puicheric. He was the commander of the beliguered garisson in the citadel at Beaucaire in 1216. He restored the Castle at Saissac. Lord of St André from 1228. Lord of l'Isle. Viscount of Blois. William, Lord of Cayeux (-sur-mer) and Lord of Bouillancourt. Eustache is the son of William, Lord of Cayeux. Lord of Saint-Brisson (now Saint-Brisson-sur-Loire). Lord of Châtillon (Châtillon-sur-Loire or Châtillon-Coligny ?). 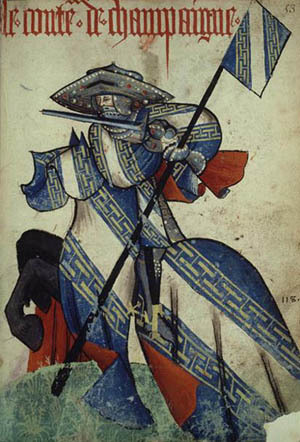 Butler of France from 1248. Second son of Stephen I de Sancerre. Lord of la Ferté-Alais. William IV was Simon IV de Montfort's half-brother, their mother Amicie, countess of Leicester, married first Simon III de Montfort, then William III des Barres. William IV is the son of William III. Lord of Coucy. Count of Roucy (~1202) when he married Beatrix de Vignory widow of John I de Roucy. Count of Perche. He was the Son of Raoul I. His daugther, Mary, married King Alexander II of Scotland and gave birth to King Alexander III. Enguerrand built the biggest tower in Christendom for his castle of Coucy : 177 feet high, 105 feet wide, 25 feet thick at his base. His motto was: "King am not, nor Prince, nor Duke, nor Count either, I am the sire of Coucy". The blazon is drawn from a seal (www.cg78.fr) dated 1206. Colours are uncertain. From 1217, after a second marriage, Simon adopted a seal with a lion. Again the colours are uncertain, but the lion might be argent as the castellans of Neauphle (Neaufle) were ligemen of the Montforts. The Neauphle family founded the Cistercian Abbey of des Vaux de Cerney, whose sixth Abbot, Guy, and his nephew, a monk at the abbey called Peter, played important roles in the Cathar Crusade. Peter wrote the Historia Albigensis, a primary source much cited on this page. Click here for more on Guy and Peter des Vaux de Cerney, and the Historia Albigensis. Lord of Lévis (-St-Nom). He become Lord de Mirepoix and Marshall of the Faith. His family later inherited Saissac. He was the son of Philip I de Lévis who had taken part in the Third Crusade. Alan de Roucy was a vassal of the Count of Champaigne and also held fiefs from the French King (Philip Augustus). Alan de Roucy arived in the Languedoc from France towards the winter of 1211, just as Simon de Montfort set off from Caselnaudry for Narbonne. He would remain in the Languedoc for ten years and was granted the lordship of Termes in 1213 by Simon de Montfort and later Bram and Montreal. He was killed defending Montreal in 1221. Historia Albigensis - Pierre des Vaux de Cernay . The Sibly's also cite Molinier 181 & 185. Lord of Champignelles, Châteaurenard, Conches, Nonancourt, Charny & other estates. Grand-Butler of France in 1223. Brother of Peter II de Courtenay. Cousin of Raymond VI of Toulouse. Canting arms. The blazon "or 3 redortes (a kind of twisted tree branch) sable (black)" alludes to the name of the bearer. Lord of Craon. Seneschal of Anjou from 1222 to 1226. He married in 1212 Jeanne, elder daugther of William des Roches. Amaury is the half-brother of Juhel de Mayenne. Michel V de Harnes [Flandre, Flanders] (1170-1231) . Son of Michel IV, who was also in England in 1216. Lord of Saint-Bris and then lord of Mello. Lord of Saint-Maurice-Thizouaille. Lord of Loches. Son of Dreux IV de Mello. Lord of Lézinnes (probably Lizines) en 1207. Lord of Villehardouin & Villy (1213). Marshall of Champagne in 1223. Seneschal of Anjou from 1199 to 1222. Lord of Longue-Jumelle and Château-du-loir . Father-in-law of Amaury de Craon. Savaric de Mauléon, Seneschal of Saintonge, Seigneur of Châtellaillon, Talmond, Benon, Angoulême, la Flotte en Ré and Fontenay. The coat of arms is taken from a seal (colours are not certain). According to the "Gilles le Bouvier" armory (No 866 / 879) Mauléon bore Argent a lion gules. With a bordure sable besanté according to the armory of Navarre (No 1301). Rietstap gives Gules a lion Or, which are the civic arms of the town of Mauléon (with a bordure sable and 8 besants). In the "salles des Croisades" at Versailles, the coat of arms is Or a lion Gules. Lord of Voisins. Became lords of Limoux (until 1296), Arques, Alet-les-Bains, Reddes [Rennes-le-Château], Caderonne [Espéraza], Couiza, Bugarach, Villarsel du Razes, Montferran, Blanchefort, Sougragne, Luc, Belcastel, Couffoulens, Pech-les-St-Hilaire etc. Seneschal of Toulouse in 1254 and of Carcassonne in 1255. Lord of Coubron, Villemomble and Clichy-la-Garenne. Chamberlain of France from 1240. Second son of Adam I. Brother of Adam II. Lord of Blaison and Mirebeau. Seneschal of Poitou. 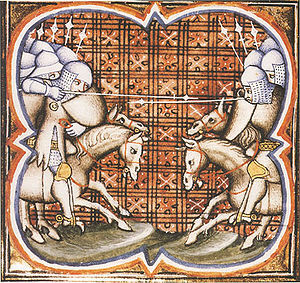 In 1180 or 1181, a great tournament was held at Lagny-sur-Marne on the borders of France and Champagne. The history of William Marshal relates that 19 counts, the Duke of Burgundy and about 3000 knights from France, Flanders, the Low Lands, Germany, Normandy, England, Anjou and elsewhere. Henry the Young King, son and heir of King Henry II of England came with more than 200 knights. They fought for glory and money in what looked like genuine pitched battles. The objective was not to kill, but to capture men or horses. Tournaments were held almost every two weeks. Here William Marshal earned fortune and fame in a few years. He and his fellow knight captured and ransomed over 100 knights in 10 months of tournaments. Many of those who attended would later find themselves as fellow cruseders in the Holy Land and in the Languedoc. Peter II, King of Aragon - Pere el Catòlic. Peter II, (1174-1213) was King of Arag�n (1196-1213) and count of Barcelona (as Pere I), son and successor of Alfonso II. He was surnamed the Catholic. The King of Aragon played a key role against the crusaders. Peter II defended the méridionals' cause, taking the part of his relative and vassal, Raymond VI, Count ofToulouse. 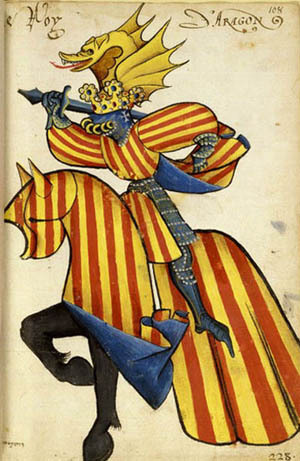 According to legend, the arms of Aragón were origially plain gold: in heraldic terms "Or plain". Geoffroy le Velu, king of Aragón, was mortally wounded fighting on the side of Charles le Chauve against the Normans. Charles, to show his gratitude for Geoffroy's bravery, dipped his fingers in his blood and smeared them onto the shield, making the present arms, in heraldic terms "Or four pallets gules". Peter died at the battle of Muret in 1213. Raymond's mother, Constance, was daugther of the king of France. He married Jeanne of England, then Eleonor, sister of King Peter of Aragon. 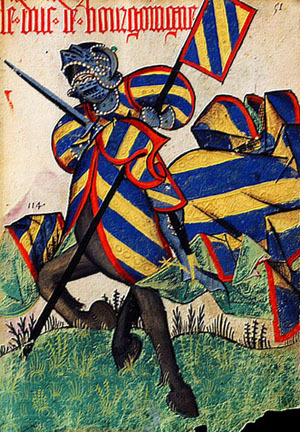 Raymond VI was the reigning Count of Toulouse at the time of the outbreak of the Cathar Wars. He was sovereign of his territories, and held his lands under the feudal system from a number of his relatives. Most of these lands were held as a vassal of the King of Aragon, but some he held from the Holy Roman Emperor, some from the King of France and some from the King of England. On 27 January 1213, Raymond VI paid homage to Peter II of Aragon (which in the event lasted only until the battle of Muret 12th September the same year when Peter was killed in battle). Raymond VI was the father of Raymond VII, Count of Toulouse. Raymond was the principle victim of the Crusade. He was present at Béziers 1209, Carcassonne 1209, Lavaur 1211, Toulouse 1211, Castel 1211, Muret 1213, Toulouse 1218. Raymond VII was the son of Raymond VI, Count of Toulouse. Lord of Samatan and Muret (vassal of Toulouse). Bernard III, father of Bernard IV, is known to have been Templar (attested in 1175) which could explain the orgin of the arms. Count of Astarac from 1174 or 1175 until his death. He is recorded in a sirvente of Bertran de Born as having joined the alliance against Richard I (the Lionheart) in 1183. Bertran calls him En Centols. Centule raised a company of Gascons along with Gaston VI of Béarn and sent them north under one Brunus (or Brenus) to aid Adhemar V of Limoges in besieging a church on the Gorre in February. The company was routed by Richard. Centule participated in the Reconquista in Spain. Lord of Andorra, Castillon, Prayas (Aragon). Raymond-Roger married Philippa, the sister of Gaston VI de Béarn, William I de Moncade and William-Raymond III de Moncade. 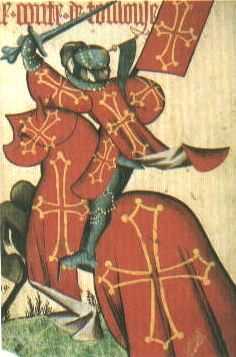 Comte of Palhars through his wife. This familly is a branch of the House of Comminges. Nephew of Raymond-Roger comte of Foix. Viscount of Béziers and Albi (vassal of the count of Toulouse). 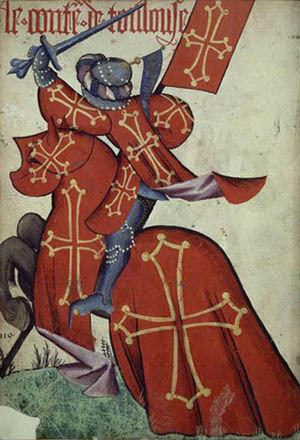 Viscount of Carcassonne and Razes (vassal of the count of Barcelona (= King of Aragon)). The name Trencavel means nutcrackers (Trenca avelana). Raymond-Roger Trencavel was married to Agnes of Montpellier. His uncle was Raymond VI Count of Toulouse. The arms of Trencavels are known through several seals. They all show a shield barry and what looks like ermine. Twooptions have been speculated: gules and ermine; and or and ermine.. Arguments for or and ermine: The Rietstap armory, volume I page 195, at the name of Béziers (no source indicated): Languedoc. Barry or and ermine. Many authors have followed Rietstap. The arms have become popular and associated with Trencavel. They can be seen in the streets of Carcassonne. The civic arms of the city of Béziers are similar with France Ancient in chief. (the semé fleurs-de-lis have been replaced by 3 fleurs-de-lis and the barry has been replaced by 3 bars). Arguments for gules and ermine: The coat of arms borne by other knights of the region such as Saissac, Barbaira, Durban and Hunaud de Lanta match both colours and patterns. (Except for Saissac and Barbaira, the arms are taken from Rietstap and are therfore not 100% reliable). "Ermine" applied on "or" is unconventional, almost unique for the time, even if, strictly speaking, it does not break the rules of heraldry because fur can be applied on metal. The association of "ermine" and "gules", on the contrary is frequent. Brian Timms who, as far as I am aware is the only person to have studied this problem in detail, favours gules and ermine, but or and ermine is far more common today. The cows are in memory of the ancient people "vaccéens" (which sounds like "cowboys" in Occitan) who submited to the Romans in 100 BC. In the XIVth century, several members of the familly used seals showing two rams (see "Sceaux Gascons" pp 182-184). These are the civic arms of Lectoure, capital of Lomagne. Although his father was a de Saissac, Peter took the name and the arms of his mother Ava de Fenolhet, Viscountess of Fenouillèdes. Lord of Mataplana from 1197. Peter de Durban was Lord of Montégut (en Couserans). Peter was the standard bearer of the count of Foix during the siege of Toulouse of 1218 (cf. Canso). Seigneur de Montesquiou, de Sansopouy, de Paders, de Serres & de Belloc. Son of Guilhem Hunaud de Lanta. The son of Bernard V.
Lord of Monteil which became Monteil-Adhémar then Montélimar. It is thought that Pons Amanieu and William Amanieu may be the Lords of Madaillan. Knight from Gascony or Quercy. The coat of arms of Hugh de Lamothe is discribed in the Canso chapter 31, lines 35 "E'l pros n'Ucs de La Mota e'l sieus vermelhs leos"
(And the valiant Hugh de Lamothe and his red lion). and again at line 68; "Per qu'en remas vermelhs lo sieu blancs gonfanons"
Chabert was Lord of Barbaira (also written Barbera). He commanded the castle of Queribus (1244-1255). Aymeric is the brother of Chabert. Oliver III was the son of Raymond III. 2. three chevrons with a label of 5. According to the author of "Olivier de Termes, le cathare et le croisé", the two seals mentioned here have been confused with those of Philippe de Montfort. Termes of Majorca bore quartered saltire 1 and 4 : gules a fleur de lis argent, 2 and 3 : argent a reversed moon. Olivier's crossbowmen on landing ships cover the unloading of Crusader troops. 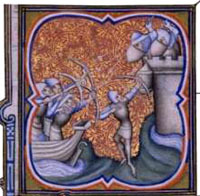 (Miniature from the Grandes Chroniques de France, XIIIth c., Bibliothèque nationale de France). Bernard and his brother Pons were co-lords of Montréal. They married two daughters of Hugues de Roumégoux and Braïde de Fanjeaux. colours are conjectured. They are based upon the Salamanca armory which gives for the name of Pertusa: or, 3 lozenges sable at the chief. Lord of Mondragon and Montauban. Dragonet was the honourable intermediary through whom Simon de Montfort negotiated the surrender of the citadel at Beaucaire. Colours are conjonctured (based upon those of Lordat). Seneschal of Agen and Castellan of Avignonet. Raymond d'Alfaro was the son of Hugues. Hugues coordinated the masacre of Inquisitors at Avignonetin 1242. Lord of Laurac and co-lord of Montréal. Aimery was the son of Blanche de Laurac who was married to a member of the house of Roquefort. He had 4 sisters among whom where Esclarmonde and Guiraude. Guiraude married Guilhem Peyre, lord of Lavaur. Guiraude and Aimery both were murdered at Lavaur in 1211 by the crusaders. 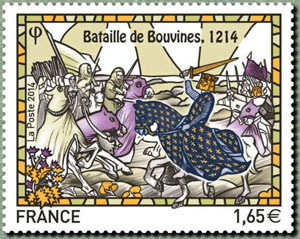 The Battle of Bouvines, which took place on 27 July 1214, was a medieval battle which ended the 12021214 Anglo-French War. It was fundamental in the early development of France in the Middle Ages by establishing the French crown's sovereignty over the Angevin lands of Brittany and Normandy. Philip Augustus of France defeated an army consisting of Imperial German, English and Flemish soldiers, led by Otto IV of Germany. Other leaders included Count Ferrand of Flanders, William de Longespee and Renaud of Boulogne. The defeat was so decisive that Otto was deposed and replaced by Frederick II Hohenstaufen; Ferrand and Renaud were captured and imprisoned and King John of England was forced to sign the Magna Carta by his discontented barons. Philip was himself able to take undisputed control of most of the territories in France that had belonged to King John of England, Otto's maternal uncle and ally.